If you’re an American with a Colombian fiance you want to bring to the United States, you could either bring him (or her) over on a fiance visa to get married, or you could get married in Colombia, then bring them back on a CR-1 visa. 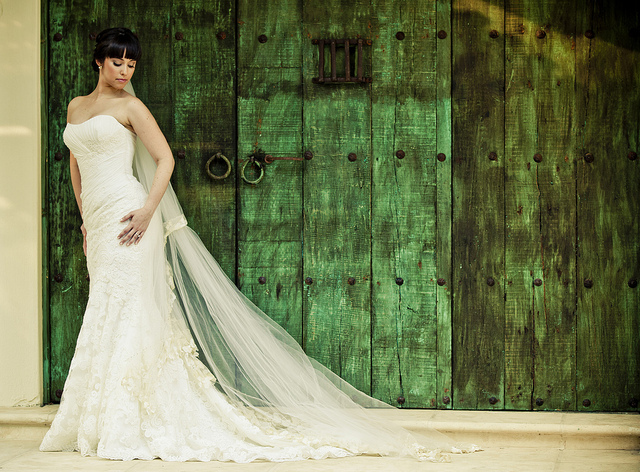 Colombia has a rich, vibrant fiesta culture, and a wedding there is usually a big deal. Whether your reason is the exotic backdrop, the party atmosphere, or your fiance’s family that make you decide to get married there, you’ll definitely need to plan. CC license courtesy of Eugenio “The Wedding Traveler” WILMAN on Flickr. There are two methods of getting married in Colombia. A civil marriage, performed by a notary or a religious marriage performed by a religious official. If a religious ceremony is performed after the ceremony you must register the marriage with a notary. The good news for you is that you won’t need to get a special visa, as an American, to get married in Colombia. You’ll just need to identify yourself with your passport and tourist visa, as well as your birth certificate. Both parties will also need verification of eligibility to marry, which you can read more about below. If you have been previously married, you may need to bring an annulment or divorce decree, or death certificate as well. For any special circumstances you are concerned about, check with the local civil office in Colombia. If you’re having a Catholic wedding, you’ll need all the civil items above, but also a certified baptism certificate and a certified confirmation certificate, which must be translated into Spanish. If you, the partner are not Catholic, you’ll also need a certificate from your church, and a certificate of no impediment written by 2 family members that verifies your relationship and that you’ve never been married before. This must also be in Spanish and solemnized by a priest. If you’ve been previously married but your divorce is not recognized by the Catholic church, you will unfortunately be unable to get married in a Catholic wedding. If you have never been married you may be able to present notarized statements from family and friends stating that you are not married. If you are divorced or widowed you will need to provide a copy of your divorce decree or death certificate. All documents must include a certified translation in Spanish. Additionally you can contact the U.S. Embassy or Consulate in Colombia for an affidavit of status but will want to check with the notary or religious official you intend to utilize to verify what they will accept for eligibility as there are no set standards and each official determines what documents they will accept. Once you have all the above documents, you will file them with a “notaria“. If you both won’t be present, be sure to have a power of attorney with the permission to file documents on the absent party. This must also be translated into Spanish. You’ll pay a fee and the notaria will then publish an announcement of your intent to marry for 15 days. This gives the public time to object, which is extremely unlikely. If nobody objects, you’ll be able to set a wedding date and begin planning. Once married you can apply for a CR-1 spousal visa for your spouse to travel to the United States. With the CR-1 visa, the spouse will receive a green card shortly after arrival. This is one benefit to the spousal visa over the fiance visa. With the green card, he (or she) can work freely in the US, and even leave and re-enter freely. 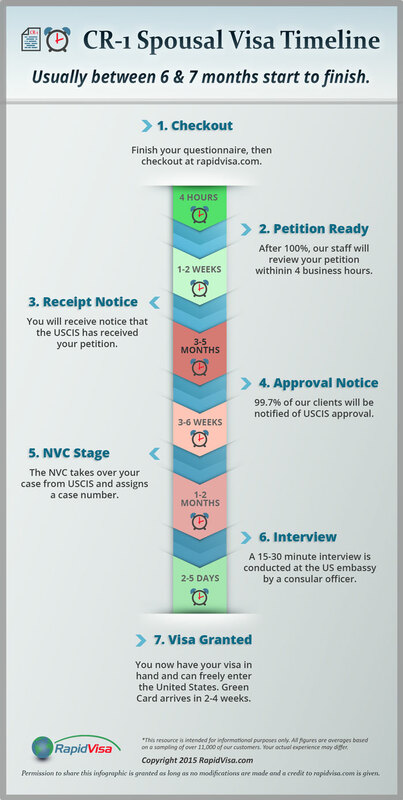 The spousal visa timeline is usually around 6 to 7 months from start to finish. So it’s a good idea to start for free now with the information you have, so that even before the ink dries on your marriage certificate you can file your petition and get the ball rolling. The sooner you get started, the sooner your spouse can be with you in the United States. RapidVisa has several agents who can support you in English and Spanish, and our entire site and software is available in Spanish as well. From the U.S. or Outside Colombia (+57) (1) 275-2000. From within Colombia (1) 275-2000. Embassy fax: From the U.S. or Outside Colombia (+57) (1) 275-4600. From within Colombia (1) 275-4600. If you have any questions about the process, give us a call at 1 (800) 872-1458. What if My Fiance’s Passport Photos are the Wrong Size? If one files a Fiance Visa but gets married in Colombia before the Visa is approved, does the Colombian marriage have any effect upon the Fiance Visa and subsequent marriage in the USA? Would it be better to wait until the Fiance Visa is approved and then get married in Colombia and USA? Would it be better to get married in Colombia and then file the CR1 and not file the K1 at all?